Our very clever, very clothed Never Cook Naked columnists, Mark Scarbrough and Bruce Weinstein, are at your disposal, able to troubleshoot everything from questionable table etiquette to tricky cooking techniques (as well as, natch, proper cooking attire). Curious to learn more solutions to culinary conundrums? You may wish to peruse previously asked questions, starting with the last column’s answers pertaining to how to ensure dinner is served warm and not lukewarm, why spinach has a filmy grittiness, and the do’s and don’ts of buying truffle oil. Or you can listen to Mark and Bruce answer your questions on the air when you listen to our new podcast, Talking With My Mouth Full, where they give you plenty to think, not to mention laugh, about. Dear Clean Freak: If you ever come to our house and scrub our cast-iron cookware with soap, we’re never inviting you back. You can forget about a Christmas letter, too. Back when one of us was in cooking school and the other was passed out drunk in grad school somewhere, the culinary instructors kept their cast-iron omelet pans under lock and key lest any student be dumb enough to wash them. See, the surface of cast iron is a warren of microscopic nicks and gashes. Over time—and after enough frying—fat fills in these crevasses. This creates a smooth, sealed surface, thereby lending the cookware a naturally nonstick finish. Soap dissolves that prized patina of crud. Wash a nicely seasoned skillet with suds just once and there goes years of work, quite literally, down the drain. 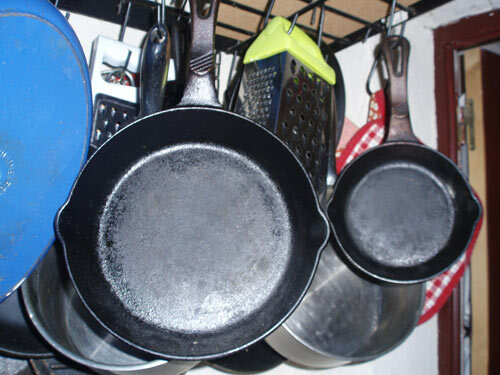 Cast-iron cookware should instead be cleaned with coarse-grain salt. Think kosher salt. Pour some in the skillet, add a little warm water, and work the crystals back and forth across the surface with a wadded-up paper towel (leave that sponge in the sink; it may contain some residual soap). You’ll dislodge burned-on bits without destroying the built-up finish. Rinse the cookware, then place it over high heat until it’s smoking to 1. sterilize it, 2. preserve the coating, and 3. dry the pan out completely so the iron doesn’t rust. Cool the cookware to room temp and it’s ready to go. Do this and you’ll end up with a shiny nonstick surface. Plus, you’ll stay in our good graces. This year’s Christmas letter promises to be more detailed than ever: every meal we ate, every dish we cooked, every vacation we enjoyed, every breath we took. Thrilling. Just thrilling. Dear Spooning: Once upon a time, when the world was young and forested, wood was cheap. In prototypical engravings from eighteenth-century France, scullery maids fended off the drunkards with raised wooden spoons, the tool of the trade. Those maids, it seems, begat food writers. Today, metal’s more abundant. But ye olde culinary lingo still has some merit. You want to use a wooden spoon on tinned copper and enameled cast iron, at the very minimum. After all, you’ve foregone contributions to your IRA to get the highfalutin cookware, so you want to keep it nice. That’s where the wooden spoons come in, as metal ones can nick or scratch the surface. That said, wooden spoons are not fit for some pots and pans—like those with nonstick surfaces, which need the soft touch of heat-resistant silicone gadgets. So yes, a wooden spoon is a cliché. But a worthwhile one. Like France. Dear Type A Personality: We have a friend who claims he doesn’t have a green thumb. We’ve watched him garden. He makes holes in the ground with the heel of his sneaker, dumps in some seeds, and then is amazed when nothing comes up. He’s just going through the motions. Not even. And he’s not practicing. The same goes for baking. It’s all a matter of practice. That pie crust may not work the first time you roll it out. You may need to try again. And again. And again. That’s not much consolation on an average Wednesday night after work. But we doubt you’re doing much serious baking on a Wednesday night after work, anyways. If you have a relative or a friend who’s a great baker, watch them. Pay attention. Apprentice. Ask to make pies together. Or tarts. Or bread. Or cookies. Also, embrace your inner fussiness. Baking is an exacting science. Measure carefully. Follow the instructions exactly. If the butter is supposed to be at room temperature, then leave it out on the counter until it’s nice and mushy. If the eggs are supposed to be at room temperature, leave them out on the counter for 20 minutes or dip them in a bowl of warm (not hot) water for 2 or 3 minutes. And don’t make substitutions. We once spent an evening teaching a friend how to make pie crust. When she tried on her own a week later, she complained that the results were a rank disaster. When we pressed further, she admitted she’d substituted cornstarch for the flour. “They’re both white,” she reasoned. And then there’s this: What’s with the “perfect” stuff anyway? Forget the TV chefs. Those people have battalions off camera to make everything look so great. Instead, keep at it. A baker’s grasp should always exceed his—or her—reach. With apologies to Robert Browning. Illustration © 2013 Eric Hanson. All rights reserved. All recipes and photos used with permission of the publisher. With all due respect, someone needs to challenge this myth that you shouldn’t wash seasoned cast iron pans with a little soap. IT IS JUST NOT TRUE. While this advice is well-intentioned, it is misleading. You do not want to leave the lingering flavor of everything you cook behind! Once a pan is well-seasoned and it has been used to fry food, even if you dislodge any bits that stick and wash it lightly with dishwashing soap, fat will and does remain behind to keep the surface of the pan sealed, and over time it gets better. Although the surface does become almost non-stick, sometimes food WILL stick, and the pan will be need to be scrubbed (and maybe even soaked!!). If in doubt, at any time, a coating of oil may be applied and the pan reheated in the oven to seal any “raw” spots. If you tell people that they can NEVER wash a cast iron pan, there will be some who end up with some grody, smelly pans. You just have to use your common sense. If you don’t believe me, I’ll be happy to post a picture of mine! Hi, Kathy. We’re going to stand by the “never” as stated in our article. While you can indeed use a mild soapy detergent to clean cast-iron cookware, you’re really only doing so as a fallback position, even according to Lodge, the maker of most of the cast-iron stuff. Yes, some people don’t want to do the salt-and-water clean-up trick; they feel they might be missing something icky. If they’re worried, they CAN use a mild detergent–with heavy emphasis on the “mild,” as in no grease-cutters in the mix. However, that surface is nonetheless full of nicks and cracks which can catch and hold even mild detergent residue–and which can become a (mildly) soapy blech in dinner. I’d suggest that if your skillet, after repeated uses, is still “almost nonstick,” it’s because you’ve been removing some of the prized gunk that becomes said coating. Again, we pour coarse salt into used pan and work it around repeatedly with a damp paper towel, removing the bits of crud and also polishing (or replenishing) the nonstick coating. We then set the skillet over high heat until smoking–and leave it there smoking for a good minute. Or we put the skillet in a 450 oven for 15 minutes. Voilà, sterilized–and even slicker. We’ve never had an omelet tear. Or a soapy aftertaste in brunch. We’d suggest that’s a testament to proper care. I STILL stand by my comment, and I should not have said that my pans are “almost” nonstick. They ARE nonstick. If and when I wash one, it is with a dishwashing brush barely passed through soapy dishwater. Another problem with saying NEVER wash them is that it will certainly discourage…because it just seems like a lot of trouble…many people from knowing the advantages/versatility of this wonderful cookware that I watched my grandmother use. The first most important step is seasoning the pans properly at the beginning. I prefer to by raw cast iron, not pre-seasoned. And of course I ALWAYS dry my pans over a flame. Addendum….What I do insist upon is that the pan be dried over a flame until completely dry. THIS IS A MUST. Ps: the breadless bread pudding was delicious and gluten free. Hi Dot, I wish it was as simple as swapping almond flour for regular flour but it is much more complicated. Almond flour contains more fat and moisture than regular flour, lacks gluten and weighs differently. So in order to swap one for the other, you need to compensate for all these factors. The best thing to do is to stick to a recipe that calls for almond flour. Once you get used to the feel of the batter, you can try to convert some of your regular recipes by adjusting flour and fat amounts and adding ingredients that mimic gluten to add structure. Have you ever coated cast iron with flax seed oil? If you use flax seed oil you’ll season it at 500 degrees so your finish will be much more permanent and can easily handle mild soap and a scouring pad. Thanks, Allie. Appreciate you taking the time to share your trick, although I was under the impression that flax seed oil breaks down when heated at high temperatures…?